Zach Mann reels in a ball at second base for Z3U. 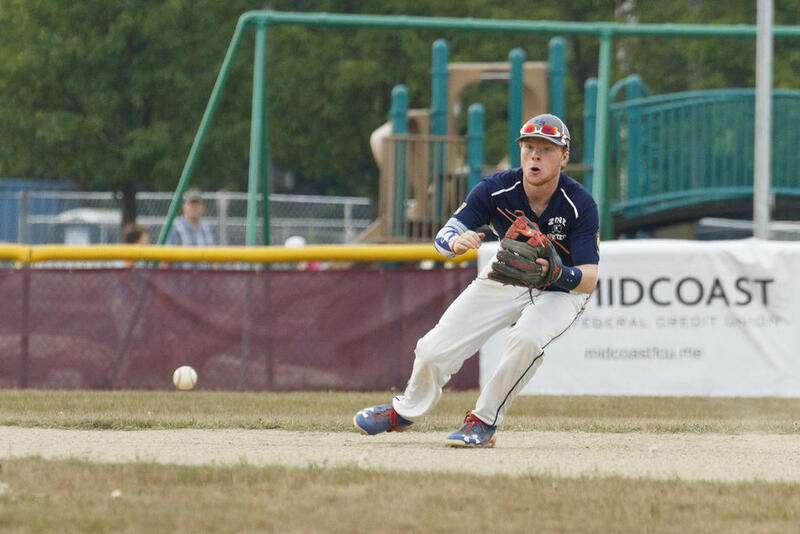 FREEPORT – Matt Riggle capped a huge, seven-run third inning with a grand slam homerun on Thursday evening, July 20, propelling Yankee Ford past Zone Three United in both teams’ last regular-season bout. Z3U began slowly to chip away at their deficit after that, adding three in the sixth on runs by Gibson Harnett, Jake Winchester and Nick McCann, for instance; they couldn’t, however, produce quite enough in the time they had left, and fell in the end 8-4. Yankee Ford combines players from South Portland, Cape Elizabeth, Scarborough, Gorham, Bonny Eagle and Sacopee Valley. Z3U, meanwhile, is built of Freeporters, Gray-New Gloucesterites, Yarmouthites and a lone Lake Regioner. Yankee Ford travels to Bangor for the State tournament this week. Z3U finishes the season at 2-16. The teams held each other silent through the first two innings; not until the third did anyone – in this case, Yankee – finally put some numbers on the board. Trevor Loubier (Sacopee Valley) began it, grounding toward third but reaching base on an off-target throw to first. Marshall Peterson (Cape Elizabeth) followed Loubier to the plate and promptly blasted a drive double to wide left; Nate Ingalls (Cape Elizabeth) then brought both boys home with a single drive to right. Thereafter, Ben Conti (South Portland), D.J. Shea (Sacopee Valley) and Alex Livingston (South South Portland) all found their way onto base for Yankee Ford as well. That’s when Riggle stepped up to work his batting magic. Riggle’s grand slam cleared the distant left-center fence and put his boys on top 7-0. Z3U added a run in the fifth, Jake Dyer (Yarmouth) scoring on a John Henry Villanueva (GNG) ground-out to short. One lone run left Z3U still trailing by a proverbial mile, of course, but they tallied three more in the fifth. Harnett reached third after his shot to center – which should’ve been no more than a single – took a crazy bounce on the dry, lumpy turf and jetted away from the Yankee Ford fielder. Harnett arrived at home when Jake Winchester (GNG) singled, and Winchester moved on to second when McCann (GNG) singled behind him. Both boys raced home on a wild pitch by Yankee Ford’s Brandon Burrell (Sacopee Valley). But Z3U would ultimately come up short. Yankee added one more in the top of the seventh – Conti scored on a Brogan McDonald (Gorham) deep-center double – then turned a 6-4-3 double-play to cut short Z3U’s last at-bats and nix any lingering hopes they might’ve been entertaining, hopes of an epic comeback. 8-4 the final. Harnett logged a solid day at the plate for Z3U, hashing a single and that triple. Jake Winchester and Zach Mann both added a single and a double. Over on Yankee Ford’s scoresheet, Marshall Peterson looked especially powerful with a single and two doubles. At third for Z3U, an airborne Eli Winchester grabs a bouncy grounder. Brogan McDonald works behind the plate for Yankee Ford in their win over Z3U. Z3U second baseman Zach Mann grabs a throw and wheels into a tag attempt on Yankee Ford’s Marshall Peterson. Z3U first baseman John Henry Villanueva grabs a throw for an out. John Henry Villanueva grabs an infield fly. Nick McCann scores for Z3U in the sixth. Jake Winchester arrives home for Z3U.